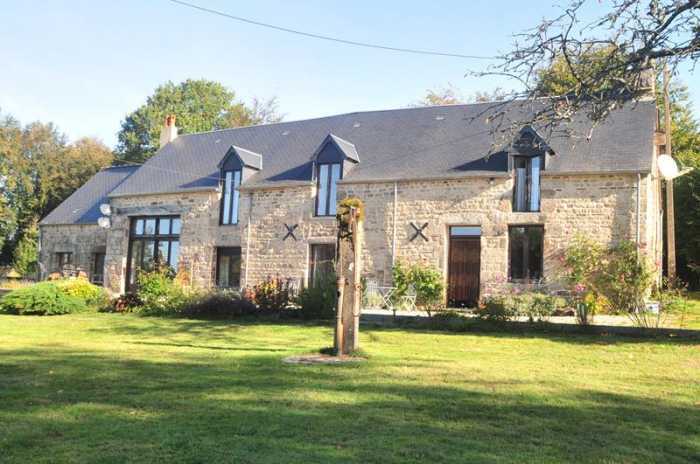 Properties for sale in Normandy, France - AHIN-SP-001108 Nr Lonlay l’Abbaye 61700 Beautiful detached stone house with attached gîte and over 5 acres. AHIN-SP-001108 Nr Lonlay l’Abbaye 61700 Beautiful detached stone house with attached gîte and over 5 acres. The property is in excellent condition throughout and benefits from wood framed double glazed windows, light and spacious family accommodation and an equally well presented gîte which has let for 45€ per night including breakfast. Viewing is highly recommended. The property is situated in the south west of Normandy near the borders of the Manche and Calvados. It is tucked away in a peaceful position within easy access of the historic town of Lonlay l’Abbaye (3k). Nearby Domfront with its medieval centre and Mortain with its petite and grande cascades are thriving market towns where excellent shopping facilities, restaurants and bars are available. It is situated in the southwest of Normandy, near the borders of Manche and Calvados. The beaches on the west coast are an hour's drive away and the property is approximately 80 minutes drive from the port of Caen and an hour and forty minutes from Cherbourg. A little further afield are the D-Day landing beaches, the Mont St Michel. The Lac de la Dathée, ideal for walking, fishing and boating, and an 18 hole golf course are within 20 minutes drive, as is the Saint Sever forest. Kitchen/Breakfast Room 5.17 x 4.25m Partly glazed door and window to front elevation. Tiled floor. Range of matching base and wall units including built-in oven and 4 ring electric hob with extractor over. Solid wood worktops with tiled splash-backs. Pantry with vent. Granite fireplace with Everhot electric 3 oven range with programmable display, hob and induction hob. Display cabinets. Radiator. Ceramic sinks with mixer tap. Utility Room 2.70 x 1.59m Tiled floor. Combi boiler. Space and plumbing for washing machine and dishwasher. Space for tumble dryer and upright fridge/freezer. Vent. Cloakroom Tiled floor. Radiator. WC. Hand basin . Lounge 8.70 x 5.76m Exposed stone wall. 2 radiators. Window and 2 pairs of glazed double doors to front elevation. Wood flooring. Wood-burner. Stairs to first floor. Exposed beams. Window seat. Bedroom 1 5.02 x 2.42m Velux window to rear elevation. Wood flooring. Radiator. Sloping ceiling. Bedroom 2 4.96 x 2.27m Window to front elevation. Wood flooring. Sloping ceiling. Radiator. Bedroom 3/Study 4.46 x 2.29m Window to front elevation. Wood flooring. Sloping ceiling. Radiator. Family Bathroom 3.05 x 1.82m Velux window to rear elevation. Sloping ceiling. WC. Pedestal basin. Radiator. Wood flooring. Bath with tiled surround, mixer tap/shower fitment and screen. Vent. En-Suite Bathroom 2.22 x 1.34m Velux window to rear elevation. Wood flooring. Sloping ceiling. Pedestal basin. Radiator. Bath with mixer tap/shower fitment, tiled surround and screen. Open Plan Living Room/Dining Room/Kitchen 4.85 x 4.82m Partly glazed door and side panel and window to front and glazed double doors to west elevations. Tiled floor. Radiator. Exposed stone wall. Stairs to first floor. Corner kitchen with 4 ring electric hob and oven. Base units. Solid wood wortops. Space for under counter fridge/freezer. Stainless steel sink with mixer tap. Landing Electrics. Wood flooring. Exposed stone wall. Bedroom 1 4.68 x 2.20m Window to west elevation. Wood flooring. Sloping ceiling. Radiator. Shower Room Velux window to rear elevation. Heated towel rail. Sloping ceiling. Pedestal basin. Wood flooring. Shower. WC. Boxed in hot water cylinder. 5 bar gate leads to parking and turning area. Garden fully fenced with sheep fencing for dogs. Courtyard garden area. Outside light. 2 paddocks. Outside tap and external electricity supply. The garden is laid to lawn with mature trees and shrubs. Shrub and flower borders. Terrace. Attached to the rear of the house is a Garage 7.86 x 4.93m Constructed of timber under a corrugated iron roof. Power and light connected. Double doors to front elevation. Oil storage tank. Mains water, electricity and telephone are connected. Drainage is to an all water septic tank installed in about 2011. Oil fired central heating which heats main house and gîte. Internet connection via satellite.